The HTX M5 Sprayer builds on the proven capabilities of its predecessor, the HTX TM-Sprayer, to offer even greater performance. The all-new, all-innovative M5 chassis, high velocity stage and heated sample holder drawer contribute to a greater user experience and expanded process capabilities. 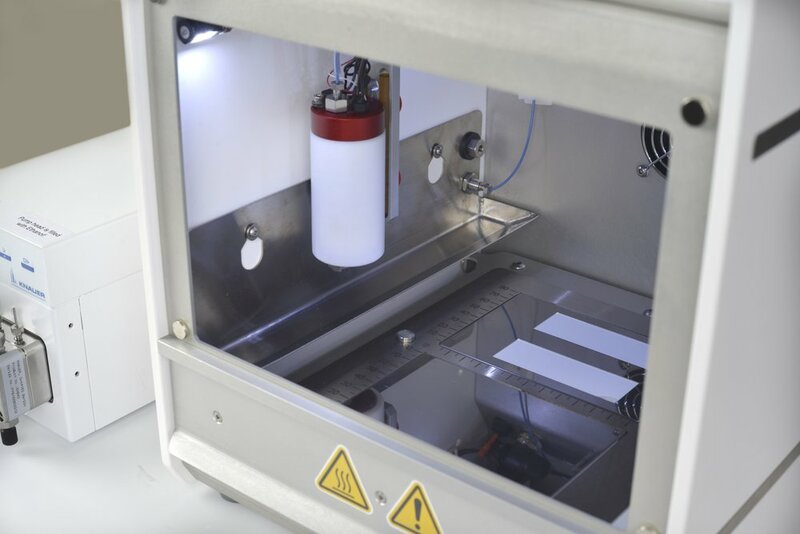 The sample plate holder is mounted on a drawer mechanism to allow easy loading of the samples, better protection of the user and better alignment of various plate types. New High-Velocity XY stage allows nozzle displacement speed of up to 5,600mm/min (4X faster than previous model) and expands the process range. Super dry spray can now be achieved at high flow rates of solvent further improving the performance of the instrument. The E/Z trough gutter design improves chemical containement and is easy to remove and clean. The bulkhead connectors are directly mounted on it to also allow easy access to the in-line filter. Download the HTX M5 Sprayer Brochure or visit the HTX Imaging Library to learn more!